Heather and Eric's Bliss Maui Wedding was a wonderful testament to the unique and immeasurable joy that only love and family can bring. The incorporation of their children and the effortless intertwining of both families was seamless and absolutely touching. 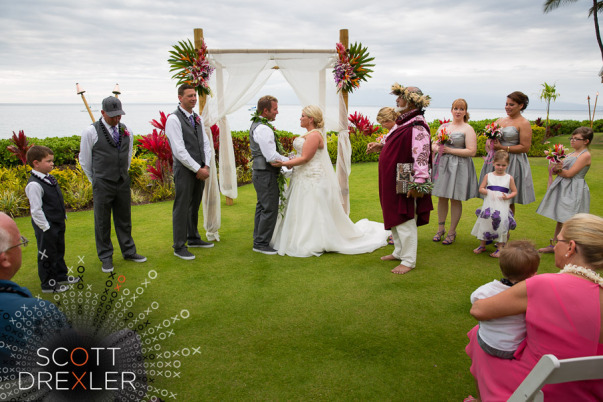 Family and friends gathered on the lush, tropical lawn of The Royal Lahaina Resort for a Hawaiian inspired ceremony. Both the chuppah and the wedding party were adorned with vibrant island florals, infusing Maui's many colors to an already vivacious and beautiful day. After the ceremony, our Bliss couple took to the sand for an unforgettable sunset before rejoining their guests for dinner and a private Lu'au. Mahalo nui loa, Heather and Eric, for choosing Bliss as the design team for your destination Hawaiian wedding.